The oldest building standing in Westerfield is the Church, dedicated to St. Mary Magdalene, a dedication shared by only 3 other churches in Suffolk. The main parts of the Church, including the tower, probably date from between 1300 and 1400, but evidence of earlier building work is visible in the fabric, and over the years there have been many alterations and additions, including the Church Room on the north side of the building, which replaced a small brick vestry (built as the village school in 1810) to commemorate 900 years since the ministry of Aluric the Priest mentioned in the Doomsday Book. 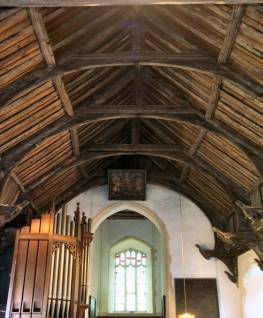 The crowning glory of the church is its magnificent single-hammerbeam ROOF dating from early in the 15th century, and one of the finest of its kind remaining in Suffolk. The tower houses three bells: the treble and second dating back to about 1400, and a tenor added in the mid-nineteenth century. The increasingly frail state of the tower has required severe restrictions on the use of the bells in recent years. 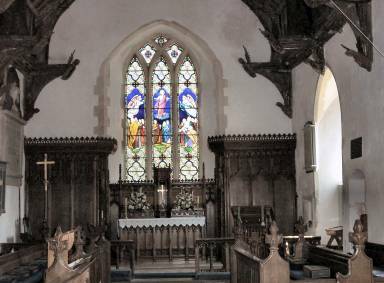 High above the Tower arch inside the Church is to be seen the royal arms of George III. Chancel–East Window The Ascension, designed by J. Bouvier and made by J. Powell & Sons. In memory of the Rev’d Mileson Edgar (1853), Rector of St. Nicholas Ipswich and of Trimley St.Mary. He was Lord of the Manor here, his family having inherited it sometime before 1819. 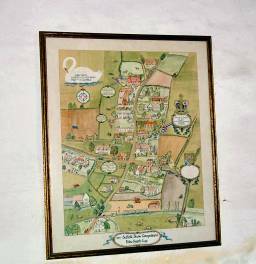 The Pictorial Map of the Parish (1977) on the nave’s south Wall is the work of Peggy Stewart, with lettering and decorative Cartouches by Brenda M. Eustace. It won First Prize (out of 94 entries) in the Suffolk Show Competition (The Felix Smith Trophy).